For Jan. 11 of the 2019 Oregon high school basketball season, here's a look back at the Plays of the Day. To see complete game stories from all these contests, go to the Prep Basketball Tab. BARLOW 82, GRESHAM 67: Dominic Jacoby hit a trio of 3-pointers in the first quarter to carry the Bruins boys team to a 29-8 lead in their Friday victory against crosstown rival Gresham. He finished with a game-high 30 points. SANDY 74, REYNOLDS 53: After seeing Reynolds crawl within four points late in the third quarter, Sandy's Colton Gorski scooped up a loose ball near the free-throw line and swished a quick jumper. Gorski started the fourth quarter with a third-chance bucket at the front of the rim to put the Sandy boys team back firmly in charge 54-41 over Reynolds. 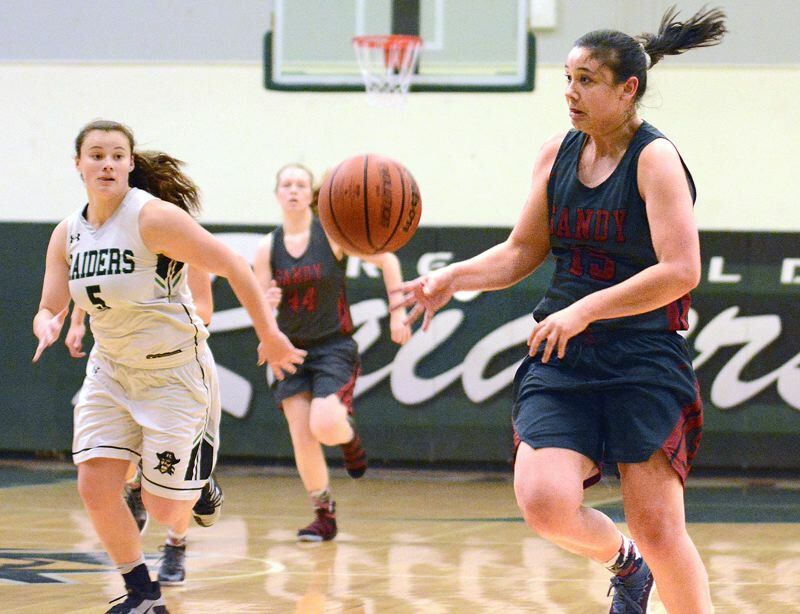 SANDY 47, REYNOLDS 28: Sandy's Izzy Cabrera had six seconds to beat the clock, and she did just that Friday night. Cabrera dribbled down the floor unchallenged to hit a 3-pointer that beat the third-quarter horn and put the Pioneers in charge 36-19 in their Mt. Hood Conference win over Reynolds. Cabrera sank four "3s" and finished with a game-high 18 points. TIGARD 66, WEST LINN 63: After West Linn cut the Tiger lead to 64-63 on a pair of free throws by junior Micah Garrett, Tigard senior Stevie Schlabach was fouled immediately on the ensuing inbounds pass. With Tigard in the double bonus, Schlabach went to the free throw line and calmly sank both of his foul shots to give Tigard a 66-63 lead with 13.3 seconds left to play. From there, the Lions' last-second 3-point attempt was off the mark, leaving Tigard with the victory in the Three Rivers League game played at Tigard High School. LAKE OSWEGO 60, OREGON CITY 46: Lake Oswego's Josh Angle buried a 3-pointer from the right corner to ignite a 26-8 run in the closing 5:27 of the second quarter that extended the Lakers' lead to 34-19 at halftime. The Pioneers got back within 36-31 with 4:46 to play in the third quarter, but went down in defeat in their return to the Three Rivers League after a four-year run in the Mt. Hood Conference. THE DALLES 61, CROOK COUNTY 54: The Dalles trailed 30-21 late in the first half of its game at Crook County when Riverhawk center Dalles Seufalemua stepped behind the three-point line and nailed a jumper to bring The Dalles to within six points. The jumper triggered a 10-0 run and The Dalles went on to win its Intermountain Conference League opener over the Cowboys. BEAVERTON 81 SUNSET 42: Beaverton sophomore Mackenzie Naro, who shot Sunset out of its 3-2 zone, ran off a screen, fanned to the left wing and flicked another backspinning rainbow that splashed through the net to send Beaverton into the half with a 41-19 lead at the half. Naro was hot in the second quarter, swishing five of her six 3-point attempts, including four straight at one point. SHERWOOD 59, FOREST GROVE 55: With Sherwood leading 56-55 with just under four seconds on the clock, the Bowmen's Blake Jensen was at the free throw line shooting two. The 6-foot-6 junior post made the first shot, but then, with the rest of his team on the other end of the floor preparing to defend the Vikings' final effort, Jensen missed the second, grabbed his own rebound and finish a whirlybird putback in the final seconds to seal his team's mammoth road win. TIGARD 63, WEST LINN 46: The sixth-ranked West Linn girls, hosting No. 5 Tigard in Three Rivers League action on Friday night, raced out to a 13-5 lead at the start of their contest against the reigning TRL champions. But the Tigers awoke then and there and closed the quarter on an 18-2 run that gave them a 23-15 lead at the end of the period, with junior guard Delaney Leavitt scoring 10 points in the final 3:25 of the stanza, including a 3-pointer from the left corner that gave Tigard its first lead at 18-15 with 1:34 left in the period.